This hire kit includes three dBadge Noise Dosimeters along with a hand-held sound level meter. Making manual measurements is often considered the most reliable method as you can be sure that the noise levels being measured are representative of a normal working day. A hand-held meter is usually the best way of checking the suitability of hearing protectors at each working point. When a worker moves between different machinery or locations it can be difficult to make manual measurements. In some environments it would be difficult to follow the worker round making measurements. In these cases a noise dosimeter such as the dBadge is a better choice. Our combination kits offer the best of both worlds as they include three dosimeters along with a hand-held sound level meter. Both the dosimeters and sound level meter are of the correct grade and calibrated for noise at work measurements in line with the regulations. The dBadge dosimeters would be mounted on workers and left to monitor for the fill working shift. In this case three workers can be checked simultaneously. 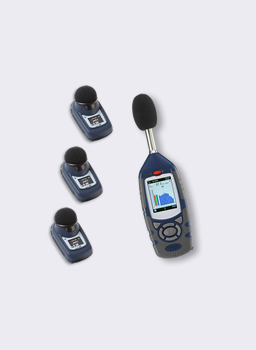 The sound level meter can then be used for spot checks, particularly where sound levels are expected to be high. In extreme cases the measurements from the meter can be used to check the suitability of the hearing protection that is available. The Combination Kit is intended primarily for carrying out occupational noise assessments in line with the noise regulations and the hearing protection guidelines. The combination of hand-held meter and dosimeters make it ideal for mixed environments of very high and relatively low noise exposure, especially where workers move between different locations or machinery. The hand-held meter can also be used to check noise levels in quieter environments, such as offices. Each dBadge is mounted on a worker's shoulder and left to monitor noise exposure throughout the working day. Although shorter measurements can be made, this leaves you with the job of calculating the overall exposure. It is better to measure for the full shift. The results can be read from the dBadge display or you can download to the software that is included. The hand-held meter is used to make manual measurements at points of interest, particularly where noise levels are particularly high or where the dosimeters have indicated unexpected results, suggesting tampering or unusual noisy activity. As with the dBadge, you can read the results straight from the meter's display. You can also download the detailed results to a computer using the software that is included in the kit. The Sound Level Meter and the dBadge Noise Dosimeters are of the correct specification for a noise at work survey in line with the EU regulations - Physical Agents (Noise) Directive 2003/10/EC - and the UK HSE guidelines. Main Parameters LAeq, LCPeak, LAFmax, many more!